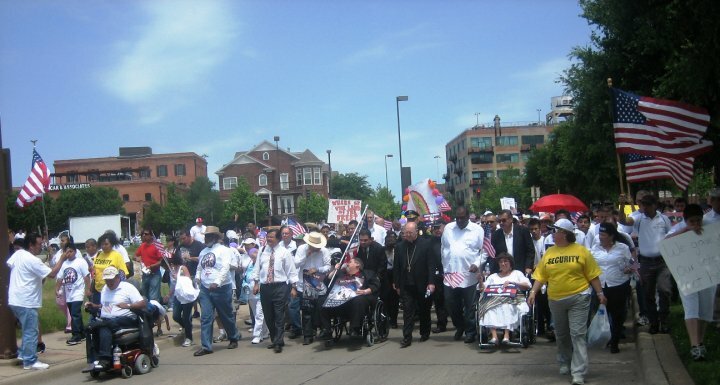 Last Saturday, I had the great honor of participating in the second MegaMarch here in Dallas, Texas. These thoughts first appeared as my sermon on Sunday, and you can hear that here. But several have asked for a transcript. So, in what follows, I will take my best shot at a “comprehensive” statement on how I see the issues of immigration reform from the perspective of a person of faith. — Our faith calls us, the Bible calls us, over and over, to speak to this issue. — Immigration, and issues of race, also directly affect Latino/Latina citizens and brothers and sisters in Christ. Immigration is a passionate issue for large numbers of our citizens. However you feel about immigration, there is no question it’s an important topic to many in our society. Saturday’s march embodies this point better than anything I know. The march featured upwards of 50,000 people(1). 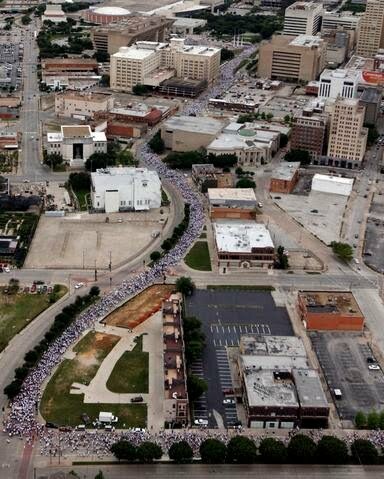 The MegaMarch of four years ago featured close to ten times this: 500,000 people. 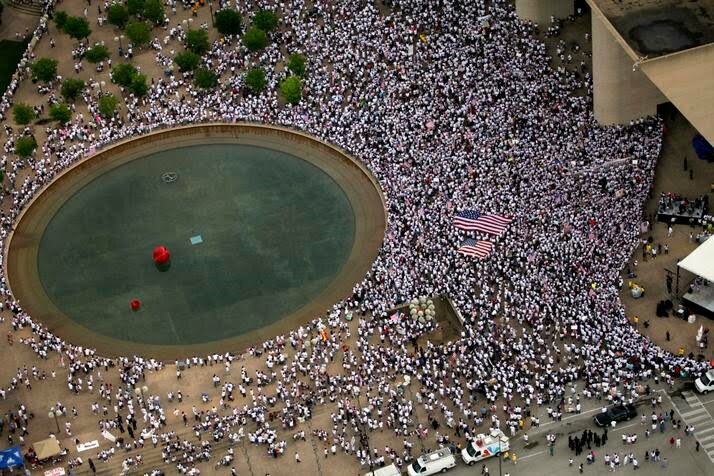 These two marches together, separated by four short years, are the largest two gatherings on any social issue in any historical time in the history of Dallas, Texas. If you added all up ALL THESE, they would not even equal HALF the total number of people involved in these two marches. Think about that. 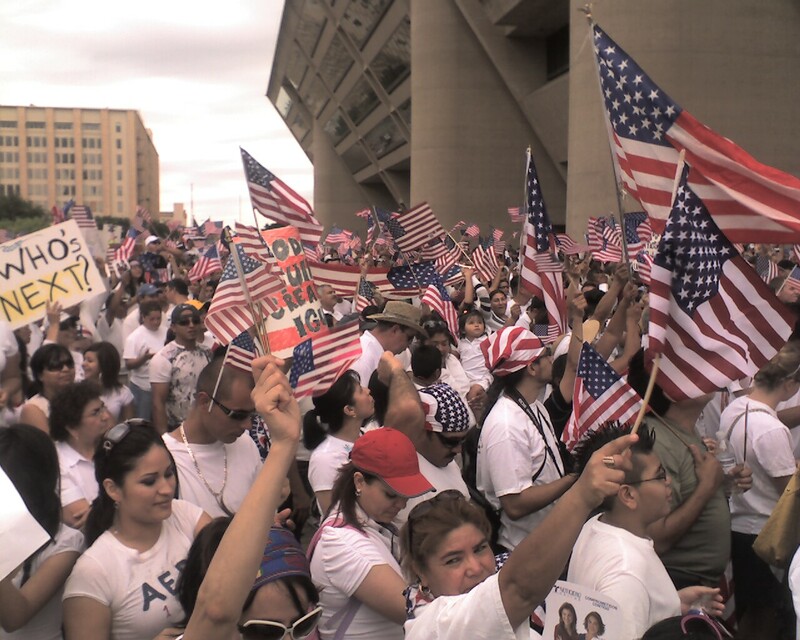 More folks marching in support of immigration reform, than any other social issue in Dallas’ history, COMBINED. (2) And lest we be misled, the vast majority of those who marched in both of these marches are American citizens. Our faith calls us, the Bible calls us, over and over, to speak to this issue. 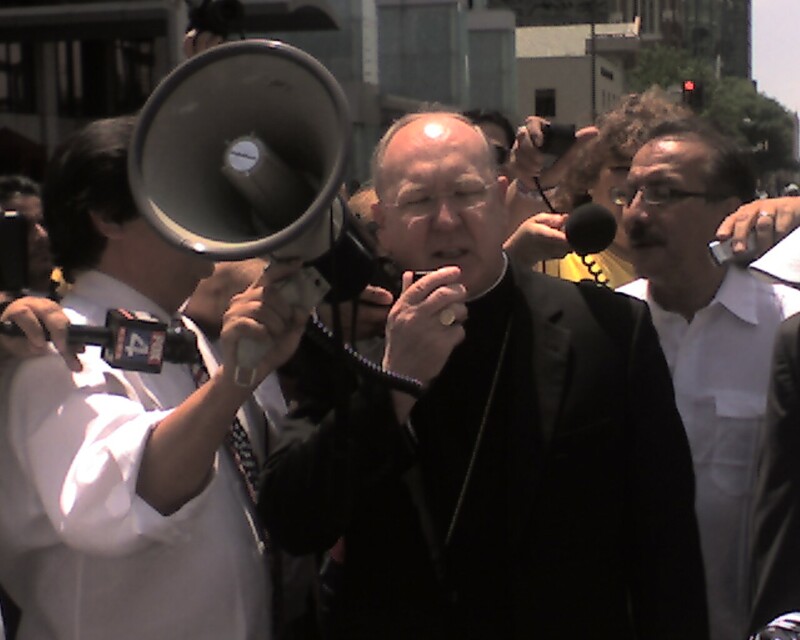 At Thursday’s press conference, I put forth some of the theological and spiritual reason why I believe it’s important to advocate for immigration reform. You can read that statement here. The Hebrew Scriptures (Old Testament) remind us time and time again, to treat the foreigner, the “alien,” the outsider as if they were one of their own. God calls God’s Holy people to reach out and love the stranger, because YOU were strangers and aliens once too. Gee, does that remind you of any immigrant nation you might happen to currently live in?! Immigration is important in the New Testament too. Jesus’ story begins with a story of migration. Have you ever stopped to consider that? The Christmas story –the story of the birth of our Lord and Savior Jesus Christ, a story we lovingly retell each December– is a migration story. And it doesn’t just end with Jesus’ birth. Soon after, Joseph follows the advice of an angel and takes the family to Egypt. In other words: before Jesus is even one year old, he is a political and religious refugee in a foreign land. When Jesus preaches his first sermon ever, (Luke 4) in his hometown of Nazareth, he tells them he’s come to preach Good News to the poor, release of captives, recovery of sight to the blind, to set at liberty those who are oppressed, and to proclaim the acceptable year of the Lord. The hometown crowd is thrilled! But! Then he goes on to remind them that God often sends prophets to foreigners and those outside the faith. And suddenly, their joy evaporates. In what must have seemed like a shocking turn of events, they seek to rise up and kill him. Even in Jesus’ day, advocating for the foreigner and the outsider could raise the anger of the hometown crowd. In Matthew 25, Jesus calls us to “welcome the stranger.” And when we do, Jesus says, we are not just welcoming a person, we are welcoming God. Friends, despite these many passages, many people draw a dividing line of the issue of “legal” verses “illegal” immigrants. Many people say, “I am all for welcoming and loving the stranger, just so long as they are here legally.” I have heard this a lot from a lot of very well meaning people. And I really do understand and respect that view. But the Bible does not make a distinction between legal and illegal. That is our modern issue. And if this seems strange, or even off-base, please see Footnote 6 below for a more detailed treatment of this issue. For those of us who are Methodists, the World IS our parish. I happen to believe that God’s call to us is to love our neighbors the way God loves us; without condition and prejudgment. God’s command is to look outside our windows, look at those in our community and to LOVE them. Period. To advocate for immigration reform is not to advocate for more illegal immigration. Far from it! Instead, it is to say that our calling should be to advocate for fair, just, and reasonable levels of immigration from our neighboring countries, and perhaps for guest worker programs such as work in other nations. I also believe our calling is to advocate for families to remain unified. What the United Methodist Church has said. 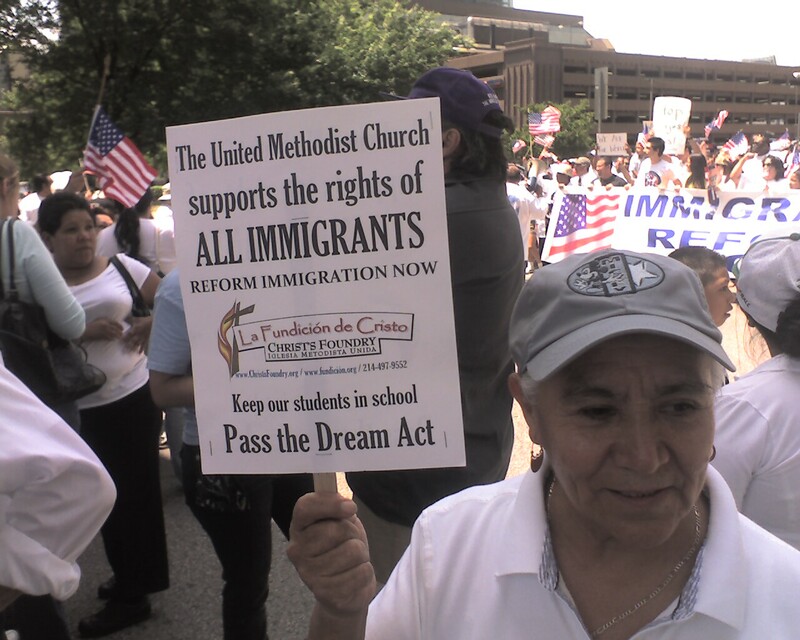 That is why the 2008 General Conference of the United Methodist Church passed a very clear resolution, calling for comprehensive immigration reform. The statement was a part of a larger resolution titled “Welcoming the Migrant to the US,” and can be read in full here. There are several more pages to this statement, which lay out specific ways a United Methodist congregation might be engaged in the ministry of supporting immigrants. And, at the end of the statement, are some specifics for why the United Methodist Church calls on the government to pass comprehensive immigration reform (and there are some examples of what the church believes that would look like). Again, feel free to read the entire statement here. That is why our friends at Christ’s Foundry United Methodist Church made these signs for us to march with on Saturday. Members of both churches marched with these signs, witnessing to the truth of our United Methodist Church’s resolution on immigration reform. Speaking of Christ’s Foundry, all these issues come close to home when I listen to my friend and colleague, Rev. Own Ross, pastor of the that church. For the past month, Owen Ross has been telling me the story of one of his members, a young man named “Cristian.” I had the great good fortune to march alongside Cristian on Saturday. Cristian is enrolled in junior college here in Farmers Branch. But a routine traffic stop there has landed him squarely in the middle of the hodgepodge of current immigration law, because his papers were not in order, even though everybody else in his family *does* have their documentation. I Facebooked with Owen the day of Cristian’s recent hearing, and I could feel Owen’s deep sadness upon learning of the judge’s initial ruling. Owen considers Cristian to be one of the most trustworthy young men in his congregation. He’s even given Cristian a key to his house, so that Cristian can watch things when Owen is out of town. Unless the decision is reversed on appeal, or unless the Dream Act is passed immediately, Cristian is likely to be sent away to a country he has never known. 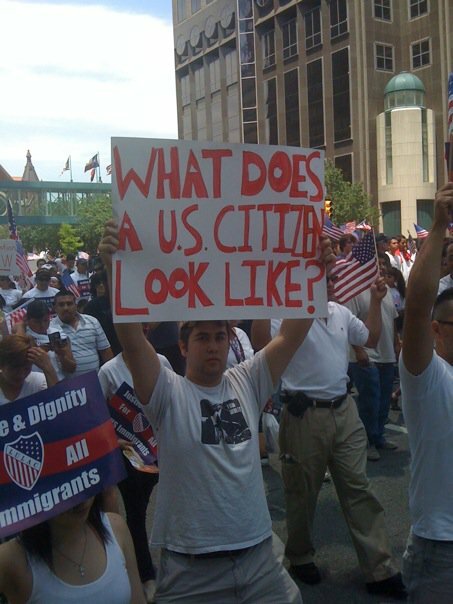 Which is why, as we marched with signs that said “Pass the Dream Act,” it was not a theoretical plea. It was about real people, and real United Methodists. Immigration, and issues of race, also directly affect Latino/Latina citizens and brothers and sisters in Christ. As I said near the beginning, issues of immigration, whether we like it or not, also open up the touchy and tender subject of race. And we must speak about this, and speak about it plainly. How do you tell who is illegal, and who is not? As somebody who for 20 years now has had Latinos and Latinas in my own family, I can assure you: you can’t. Laws like Arizona’s run the risk of violating the liberty of our own citizens, precisely because racial profiling and stereotyping still goes on in our society. Sometimes, it’s innocent. Sometimes, it’s not. But it happens. The sensitive truth is, we ALL do it. we all make assumptions about other people, and about their race and status. Blacks do it to whites, and even to other blacks. (Remember Spike Lee’s “School Daze?”) Latinos do it to each other, and to other groups. Whites do it to each and to other groups too. There is a much of this that is racism-neutral…ie, is not about racism, but is simply about the assumptions we make about people. But in the specific case of Latinos and Latinas, it happens far more often that you might imagine. 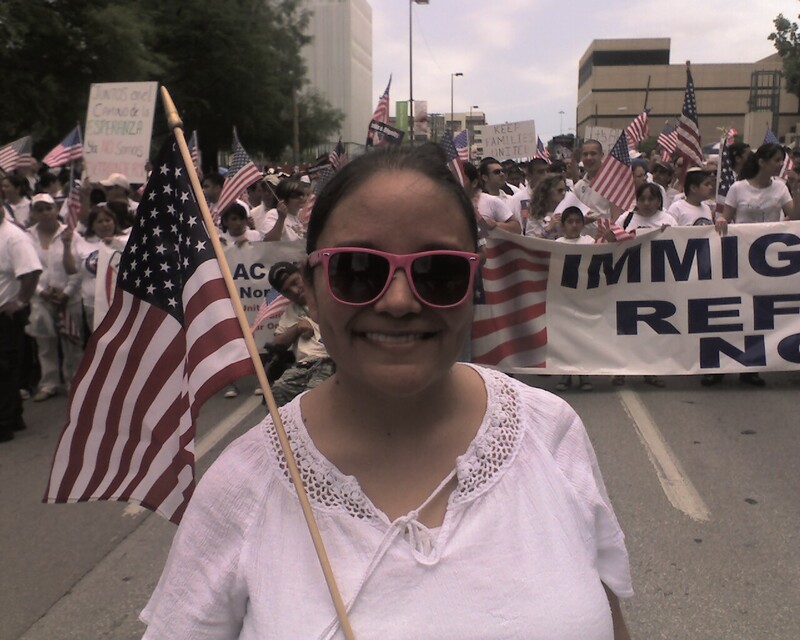 Perhaps you read the story in the Dallas Morning News, from Mercedes Olivera over the weekend. She relays a story from my old and dear friend, State Representative Rafael Anchia. Raf tells a story of growing up in Central Florida, and of being denied service in a restaurant because he and his family –more light skinned Latinos– were speaking Spanish. 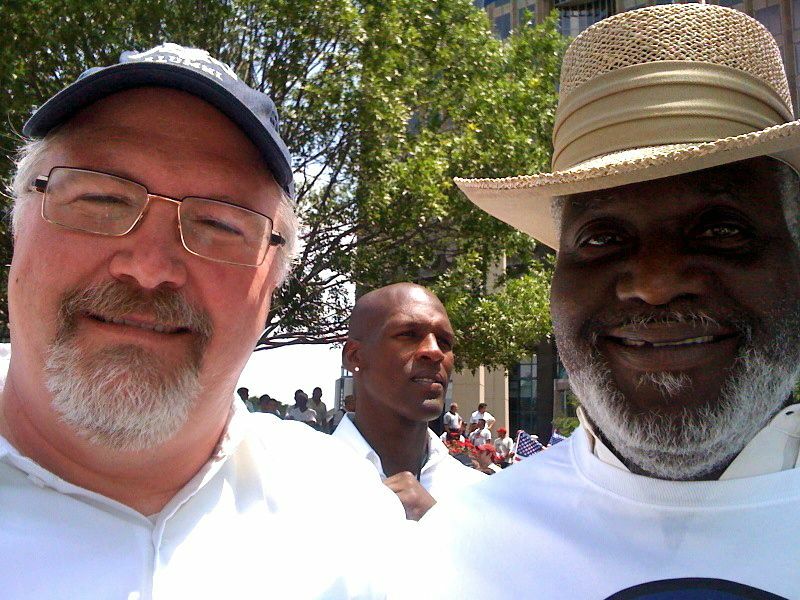 This man, now a state representative, knows and remembers what being profiled is like. And so it is that many Latinos don’t teach their children Spanish. That was the case in Dennise’s home. (8) As she grew up in Irving, her father, Richard Garcia, remembered his own experience of being punished for speaking Spanish in a West Dallas elementary school –a teacher locked him in a closet. So, he vowed to *not* teach his own children Spanish. Flash forward to a time when Dennise was a little girl. Her father Richard had had a heart attack and had to stop work as a spot welder. He eventually started mowing lawns to make ends meet. They mowed lawns all over near North Dallas. (Every now and then, we’ll be driving around, and Dennise will point one out. The closest is about four blocks from Northaven…) On weekends, she and her siblings would go to help. One Saturday, while Dennise was out helping, her father was around the corner and out of sight, when she was approached by INS agents. They came up to her and began speaking to her in Spanish. Which, as you might imagine, terrified her because a) they were big scary-looking government guys, and b) as I just mentioned she didn’t speak Spanish! Lord knows how “guilty” she must have looked to them, as she stood there mute, unable to respond to their spanish inquiries. A young man come in the room. He’s a “runner” with documents for the court. He comes into the room, takes a brief look at Dennise, and then turns to wait to talk to Dennise’s two office staff members. And at this, the young man looks back again, and for the first time, seems to really see who she is. Filled with embarrassment and apology, he approaches her desk. I suppose this misidentification could have been about being a woman, except that everybody in the room was a woman. We’re left with almost no other choice than to assume that this was the kind of thing that Latinos and Latinas will tell you happens all the time: incorrect assumptions and stereotypes about who they are. This example was SO ridiculous that Dennise was never angry at this guy. In fact, this example is so incredibly ridiculous as to make you laugh, really. These are just a few of the stories I have heard during my life. There are more, please believe me. More from Dennise’s life. More from the lives of friends I’ve made along the way. Stories of clear race-based incidents, many of which are innocuous. But that’s not the point. The point is: they happen. And they happen in ways that they never happen to me. That if it is THAT easy to make assumptions about a clearly identified Latina, how, dear friends, can we believe that a law like the one in Arizona will be impartially enforced? The obvious answer is: we can’t. And this is not to impugn the good law enforcement officers of Arizona, or anywhere else. But it is to note that it is our human nature that makes assumptions. And in the case of race and the power of the state, it would be far too easy for law enforcement to infringe the rights of our own law abiding citizens. All this is why many of our Latino/Latina brothers and sisters are rightly concerned about the Arizona law. Far too many of them have their own stories of being profiled, and know how easy it would be for such a law to be abused. Time after time, Jesus reminds us to love the neighbor. Time after time, Jesus reminds us that our “neighbor” is often one we we consider to be a foreigner and an outsider. In the famous parable of the Good Samaritan, the good neighbor is an “other,” an “outsider” a Samaritan. “Love your neighbor as yourself,” Jesus says, is the greatest and most fundamental commandment of all. All the rest hang on this one. 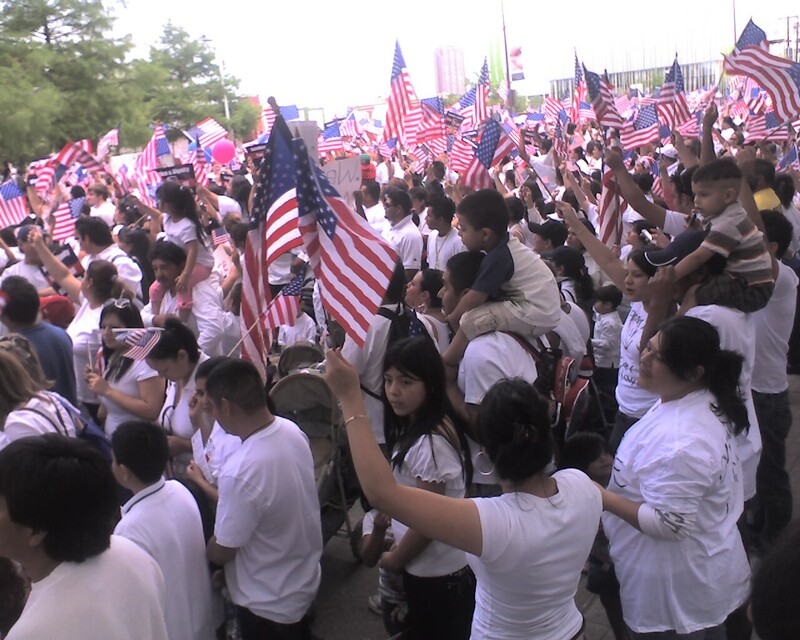 Tens of thousands of people wearing white shirts and waving thousands of American flags. 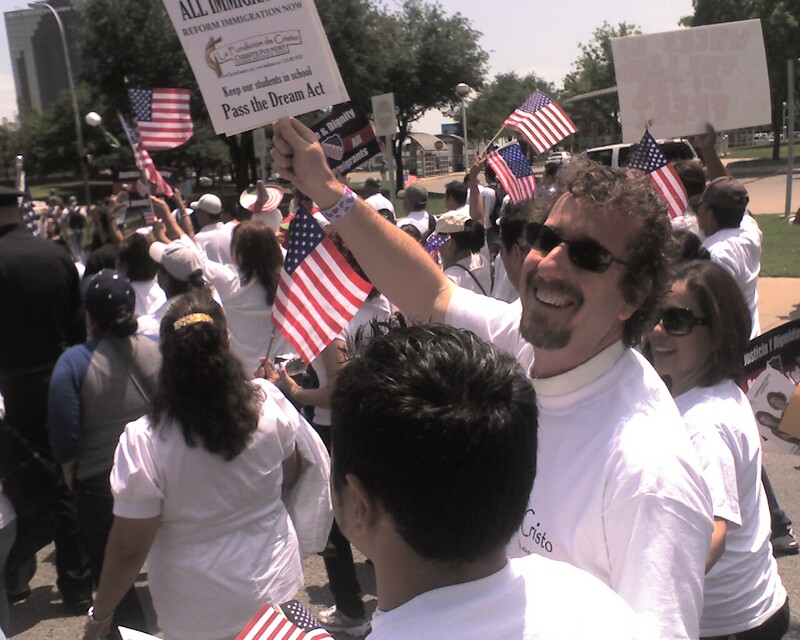 Immigrants and citizens standing together, with a common and positive message advocating for the inclusion of all people. Tens of thousands of people marched; and just like last time, not ONE arrest! Marchers even brought their own trashbags to pick up after themselves..and the city, last time, commended the marches for how neat and clean they left the parade route. Jewish, Christian and Muslim clergy, all marching —as were at least six of our United Methodist clergy– in support of immigration reform. All witnessing to the truth that: we CAN welcome the stranger….we CAN embrace the outsider…we CAN LOVE the stranger as ourself. Not only can we, but believing that God calls us to this work. Near the middle of the march, something happened that almost brought me to tears, and almost brought me to tears when I saw it on the news later. Midway through the march, we passed the Sheraton Hotel(9). It’s the scene of the annual “Black Tie Dinner,” which many of us here at Northaven enjoy each Fall. We march past the backdoors –the loading docks– of that hotel. And as we looked over, we saw the mostly Latino and Latina faces of hotel workers who had come out to greet us. They were dressed in the uniforms of maids and dishwashers; busboys and bellhops; short-order cooks and waiters. It struck me that some of them might have served me (and maybe some of you) at the Black Tie Dinner. They were lined up against the wall, on the outside sidewalk as we passed by. Wide-eyed, they were smiling and they were cheering. I don’t know if all of them are legal or not. But I thought of all those who are like them. I thought of all the thousands of people who were working that day and could not get off work to come to such a march. I thought of all those everywhere who work and serve, cook and clean, and generally keep our city running, quietly and behind the scenes. And, in that moment, what I knew that Saturday’s march was for THEM. They are why we marched. They are why, in God’s name, we advocate for immigration reform, and a more just world for all God’s children. (1a) This one shows Kaye Gooch, Bryan Coley, Rachel ‘Rei’ Coley and David Coley at the 24 sec mark. Kim Batchelor at the 40 sec mark, and Ron Wilhelm and Linda Harris at the 44 sec mark. This one shows Kenny Wickline at 9:12 mark. Bob Radford and Mike Kelly at 8:47. And this final one show me at 5 min and 38 sec. These clips also give you a sense of just huge this march was. (1)Initial estimates placed the crowd size at 25,000. Later police statements indicated that this number refers to the total number that gathered at City Hall plaza after the march, and that the total number of marchers was likely between 50 and 60,000. My sermon refers to the initial estimate, which was all that was known at the time. (2) I have spoken with many friends who have been “activists” on various causes in Dallas’ history. All have agreed with the basic premise of my statement. 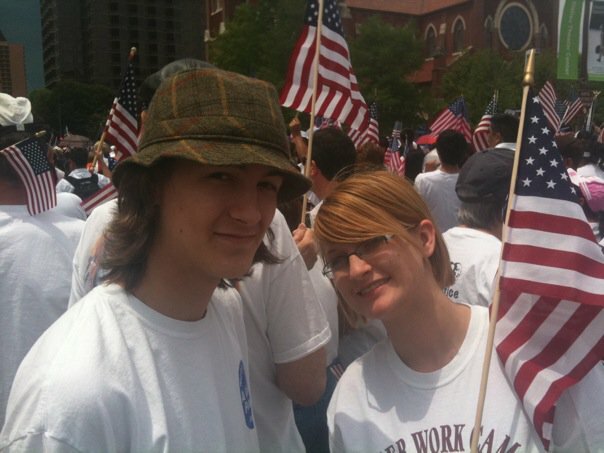 For example, a “peace rally” just before the Iraq War began drew 5,000 people to downtown. Nothing to sneeze at, for sure. But a tiny sliver of the 550,000 who marched on immigration. Think of it another way: have there been even 10 rallies of 50,000 people? (No). Have their been 20 of 25,000 people? (No). I am fairly certain the basic premise here is solid, and would love for some journalist to confirm it. (3) If there had been recent Peace marches –if any other social movement was getting lots of press right now– I would likely mention them too. I’m not trying to make any political point here. (4) The national rally in support of immigration reform, which took place the weekend health reform was passed and got almost *no* national press, drew the largest one-day crowd to the National Mall in Washington in the Obama Administration’s tenure…larger than any other gathering on any social issue there, and serving to make this same point I am making here, on a national scale. For a very comprehensive list of these and many other Old Testament and New Testament passages, click here. (6) I have checked this with several prominent Biblical scholars whom I know personally, and each agree with this assessment. To suggest that there was some sort of distinction made in these Biblical texts between “legal and illegal” makes no logical sense, and would undercut the main theological justification of the passages (“remember that you were once an alien”). You will recall that Israel’s status in Egypt was as a group of slave people. Not only were they not citizens of Egypt, they weren’t even a status of foreigner afforded legal rights of any kind! I note this because some Biblical scholars claim the words “sojourner” or “alien” or “stranger” refer to some kind of legally sanctioned status within ancient Israel. The implication being: therefore these passages do not apply to “illegal immigrants” of today. However, as I’ve just noted, this interpretation makes no logical sense in the original context of the passages themselves, when the original metaphor given was to remember being a nation of slaves; without any legal rights whatsoever. The call to God’s holy people is to not be like the Egyptians –who denied rights to their forebearers– but to look past legal status and welcome all who are “aliens,” “strangers,” or “foreigners.”That is precisely what will distinguish them as God’s Holy people, and not simply another average nation in a world of average nations. (7) I learned later that this is young man is Sol Weiner, son of our friend David Weiner. (8) I thank Dennise for the permission to share these stories, which are really her’s. (9) I incorrectly identify this in the sermon as the “Adams’ Mark,” which was its name a few years back. I need to keep up. Praying for a Peaceful March. Well-spoken, Eric. Thanks for that. This is beautiful, Eric – thank you so much!